The T100 is a nice little convertible tablet/netbook. 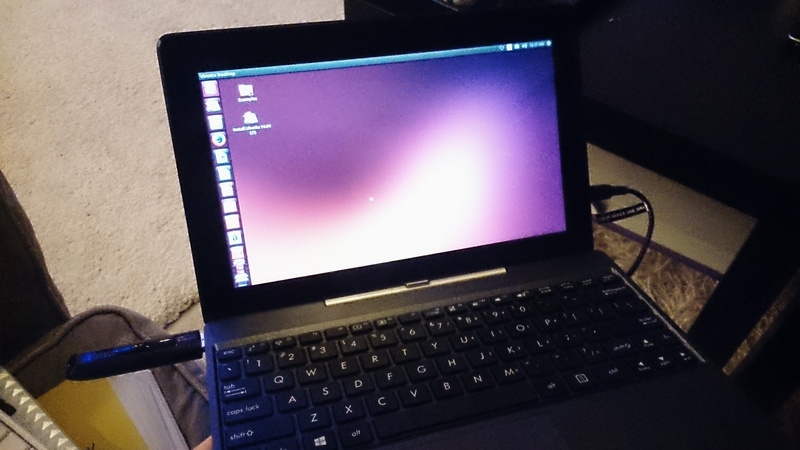 My aim is to get a “perfect” Ubuntu installation on the T100, such that it can be used successfully as a daily machine in both netbook and tablet modes. Unfortunately Linux support right now is quite rudimentary, and installing it requires us to jump through a few hoops. The situation is improving rapidly however. So I will keep updating this How-to as new drivers become available and things improve. See the latest update. Eventually I expect hardware support for the T100 will be excellent, but we are not there yet. In order to get the best support possible, we will be using bleeding-edge builds and the latest Linux kernels. If you’d just prefer an easy life, come back in October and just install Ubuntu 14.10. That said, this little convertible is a lovely machine, and Ubuntu/unity works very nicely on it — finally Unity has a purpose! The more people get on for the ride now, the quicker we can test and iron out bugs. I’ll update this whenever I manage to get new things working. I will only add items to the How-to below that are confirmed to work well. First things first, update using Asus LiveUpdate to the latest “BIOS” available. At the time of writing, that is v304. Do any backing up of Windows / recovery partitions. I’ll leave the details of that up to you. Before we attempt to boot Linux on the T100, we need to do some preparation, so start in Windows. Download the latest daily AMD64 build of Ubuntu 14.04 from here. Download the Rufus USB bootable image creator, and “burn” your downloaded ISO to a spare USB stick. In Rufus, for “Partition scheme and target system type”, choose “GPT partition scheme for UEFI computer”. For “File System”, choose “FAT32″, and leave the rest at default. At the bottom, check “Create a bootable disk using: ISO Image” and select your downloaded Ubuntu image, then hit “Start”. When your USB stick is ready, close Rufus. It should now be browseable in Windows. Browse to the EFI\Boot directory, and place this bootloader (named bootia32.efi) there. This bootloader was compiled from source using the latest Grub2. If you don’t trust random downloaded files from the Internet (and you shouldn’t), you can find the instructions for building it yourself here. Now, insert the USB stick and reboot to the firmware (BIOS). You can do this in Windows by holding shift when pressing “restart”, then touching Troubleshoot → Advanced Options → UEFI Firmware Settings → Restart. Once there, disable SecureBoot, then visit the boot options, and ensure the USB stick is the first in the list. Press F10 to save settings, and after a few seconds you will be in the GRUB bootloader. Before the timeout, immediately hit CTRL-ALT-DEL. This will reboot the computer again, but this time you will have the laptop’s native resolution (rather than being stuck at 800×600 from the “bios”). Then press F10 to boot. You should get all the way to the Desktop. Click the “Install Ubuntu” desktop icon to install Ubuntu permanently. The partitioning scheme you choose is up to you — but you will need to preserve the EFI partition, so don’t just partition the entire disk for Ubuntu. In addition to the EFI partition, I prefer separate /, /home and /boot mount points; but that is up to you. You could squish down the Windows partition and created the additional partition(s), or just delete the Windows partition altogether if you don’t need it. When done, reboot, leaving the USB stick in. Ubuntu won’t boot yet. We’ll need to compile our own bootia32.efi to use with Grub. To do that we really need a wireless connection. So we’ll boot manually, fix up wireless, and fix Grub. Boot back to the Grub welcome screen on the USB stick. Hit ‘c’ to drop to a Grub command line. Here, (hd2, gpt5) refers to the fifth partition on the third disk (Partition numbering begins at 1 and disk numbering begins at 0). This will vary depending on how yo uinstalled and your T100 model. On my 32GB model, Grub assigns the USB stick as hd0, the read-only recovery flash chip as hd1, and the main internal flash as hd2. gpt5 is the fifth partition, but it will depend on how you installed. Fortunately, grub has good auto-completion features, so you can hit twice as you type, and grub will list possible completions for you — just keep trying until you see the various vmlinuz kernels. The root=/dev/mmcblk0p5 will also depend on the partition you installed to. It will be your root partition. Unfortunately this can’t be auto-completed, so if you can’t remember your partition setup, you’ll need to try by trial and error. To complete the line, press Enter. With luck after hitting Enter, you’ll boot through to Ubuntu. If not, don’t be disheartened — keep trying. To get further, we’ll need wifi. However internal wifi on the T100 isn’t terribly reliable under Linux yet. If you have access to another wifi dongle, you might want to try that until you’re fully set up. You’ll now need to reboot using the same procedure again, and wifi should be working. If you find a firmware/nvram combination that works really well, please share. We can’t keep rebooting like this… so let’s fix Grub. This assumes you now have a working Internet connection. This will create a directory, ‘grub’, in your EFI partition. This should be enough to allow you to boot from the “ubuntu” option in your EFI firmware. Before you boot, let’s add the default command line options to Grub. Congratulations! you should now be able to boot/reboot directly to the Ubuntu desktop! There are still a lot of things to get working. The best way to improve hardware support further is to use the latest development branches of the kernel. 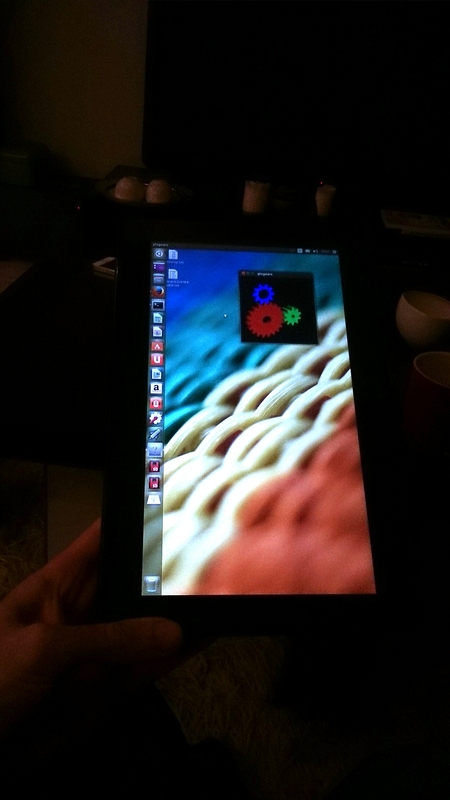 Unfortunately (as at the time of writing), even the latest development Linux kernel (3.14-rc5) lacks some key hardware support for Baytrail tablets. But we can improve that by pulling in latest patches for sound. We’ll also compile in a new experimental feature for accessing 32-bit EFI services from a 64-bit system, as we need that for tools like efibootmgr to work. Finally, we’ll pull in the latest wireless fixes and the latest power management changes. We need to power management changes for our battery patch. I recommend you compile this on a fast desktop computer with a decent network connection. You could do this on your tablet, but it would be extremely slow. For the following instructions, I assume you’re using a recent 64-bit Ubuntu on a desktop. If you’re using 32-bit, you’ll have to change the instructions to cross-compile — I’ll leave that up to you (and Google). They should all apply without error. Now we’re almost ready to compile. Before we do, we need a .config file to tell the kernel build system what parts we want to compile. Start by copying over the current one from your T100. You’ll find it at /boot/config-xxxxxx , where xxxxxx is the version of the currently running kernel. Grab it and copy it to the kernel/source directory you’ve just been working in. Rename it to .config . This will prompt you to set configuration for the things that will be newer in this kernel. Select ‘m’ to compile relevant drivers as a module where offered (in particular all the ‘soc’ sound options). Select ‘Y’ to enable EFI mixed mode where offered. Leave the kernel debugging options off. The above assumes this is on a quad-core processor with hyperthreading (hence the ‘-j8′, or 8 simultaneous processes). Reduce this number appropriately if you have less cores. This will take some time (anywhere from 20 minutes to over an hour. If you’re doing it directly on the T100, all bets are off – it could take all day. When complete, you’ll have a set of .deb packages in the directory above (i.e. in the “kernel” directory). We need “linux-headers-xxxxx.deb” and “linux-image-xxxxx.deb”. Choose the smaller of the linux-image packages, the one without debug symbols. Copy them over to your T100. Sound won’t yet be working. First, you’ll need some more firmware. For now, you can grab it from ChromiumOS, here. Unpack the archive and copy the files to /lib/firmware/intel . The drivers are in a bit of a raw state — they expose about a hundred oddly-named mixer and DSP devices to ALSA. We can set some defaults. Grab the defaults file here, and copy it to /var/lib/alsa/asound.state . For me, my sound still sounds pretty awful. I need to mute the distorted right channel in alsamixer, then at least it is bearable. I also find the CPU runs a bit hot with sound enabled. Let me know if you have more luck. Then reboot and the card reader should be working. So far, the only additional driver I have working is the light sensor. Please download and test my driver here. I have made some additional small scripts to improve usability. Dock scripts: These enable/disable the Onboard on-screen keyboard when you undock/dock the tablet. Set up the onscreen keyboard first in System Settings → Accessibility, then the scripts will enable/disable they keyboard for text fields. Rotate script: This will rotate the screen and touchscreen when run. You can place the desktop entry on your desktop. We can connect the orientation sensor to this later, once that is working. Danke für den Beitrag, aber ich kann 03.2018 erneut kein linuxmint-18.3-cinnamon-32bit.iso installieren. Microsoft Windows 10 ist nach letzten Update erneute pure Sabotage in der Welt und ich möchte es nie wieder in meiner Umgebung sehen. Alle Computer sollen nur noch Linux bekommen. Kann mir bitte jemand helfern? Ich habe viele Linux Distributionen mit “rufus” auf meinen USB3-Stick gebracht. Auf jedem PC bootet der Stick, aber nicht auf dem ASUS T100 mit aktuellen Bios-Update. Was kann ich noch tun? Ich hatte 6×18 Std. Arbeit und ich komme leider nicht weiter. Ist das ASUS T100 generell für Linux geeignet, oder müssen wir uns weiter mit Microsoft quälen? = Aber solche endlose Saboteure, die gehören für alle Zeiten verhaftet! Was macht man mit solche Saboteure? Nur distanzieren? M$ ruiniert jedes Unternehmen in dieser Welt, es ist so mega puuuuh! target brand zantac valacyclovir price comparison piroxicam sopharma 7.5 300 vicodin price augmentin duo forte price where can i buy viagra toronto letrozole generic vs femara where can i buy metronidazole pills buy soma online in usa dilantin price comparison And we believe theoriginal NPRM, and the supplemental, are flawed public policy,for a number of reasons. We are talking about the man who has up to this point assumed responsibility and been the person you could depend upon in time of need. Now, I have seldom had much good to say about Charles Meck, but I think it is a nice little book, filled with solid information, especially for those who are just starting their journey thru fly-fishing. The hearing also consideredthe U. Published: (2005)The National Flood Insurance Program and repetitive loss properties : hearing before the Subcommittee on Housing and Community Opportunity of the Committee on Financial Services, U.
I do struggle to install ubuntu on my Asus T100TA without success. On my machine there is not a bios Secure Boot Enable/Disable option so the USB booting fail. My machine run Win8.1 and is foreseen with 32 GB memory. Thanks in advance. Bro! Viewing this on a perfect T100 install!